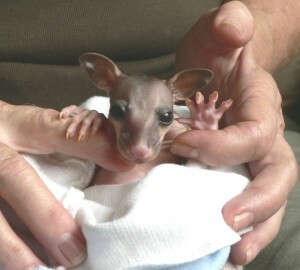 How to protect the fruits of your labour – Northern Rivers Wildlife Carers Inc. Properly netted fruit tree with polypipe over timber stakes. This frame is also easy to remove when the tree has finished fruiting. No wildlife has been caught in netting on this property since using this setup. It’s summertime and nothing says summer more than a tree in your backyard laden with fruit, particularly mangoes. But what do you do if someone, or something, is beating you to that delicious ripe fruit? Many are happy to share their fruit with local wildlife, but for people who really want to protect their crop there are some wildlife friendly solutions. The easiest solution is to pick your fruit early and let it ripen on your window sill. If you prefer your fruit to ripen on the tree, fruit bags can be tied over the fruit. Fruit bags will not only deter wildlife but will exclude insect pests such as fruit fly. Shadecloth (30-50%) is an easy, temporary, inexpensive deterrent for flying foxes and it will still allow the fruit to ripen. Fold the shadecloth over fruiting branches or throw a piece over small trees and peg into place. If you do want to use netting, be aware that some types of netting can be a deadly hazard for wildlife. If a native animal becomes entangled in the netting, they can severely injure themselves. So severe are the injuries that many entangled animals die. There are two golden rules when using netting to protect your backyard fruit tree. 1 Never use black, nylon, monofilament netting. This netting is particularly deadly to wildlife, and is responsible for the deaths of hundreds of animals annually. It can be easily pulled out of shape by an animal climbing on it, causing it to become entangled. Instead use knitted mesh with a maximum mesh size that you can’t poke your finger through. 2 The netting must always be taut, if the netting is loose or has a loose shape it will trap wildlife. 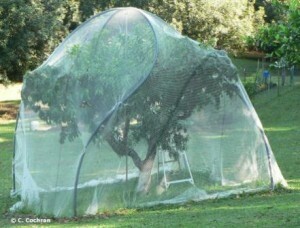 To keep netting taut build a frame out of pvc pipe metal or timber that will keep the netting off the tree. Alternatively you can use a number of star pickets or stakes, crossing them to make a tepee frame. For netting to be safe for wildlife, it needs to be tensioned enough that folds of netting do not form around the animal when it lands or crawls over it. Ideally a flying fox should almost bounce off the net rather than sink into it. Visit the wildlife friendly netting website for detailed information. Remember to check your netting daily and if despite these precautions an animal does become entangled ring the Northern River Wildlife Carers on our 24 hour rescue hotline. If you find any injured or orphaned wildlife, please call the Northern Rivers Wildlife Carers on: 6628 1866 and for seabirds and marine turtles only Australia Seabird Rescue – 0428 862 852. For koalas please ring Friends of the Koala on 6622 1233.